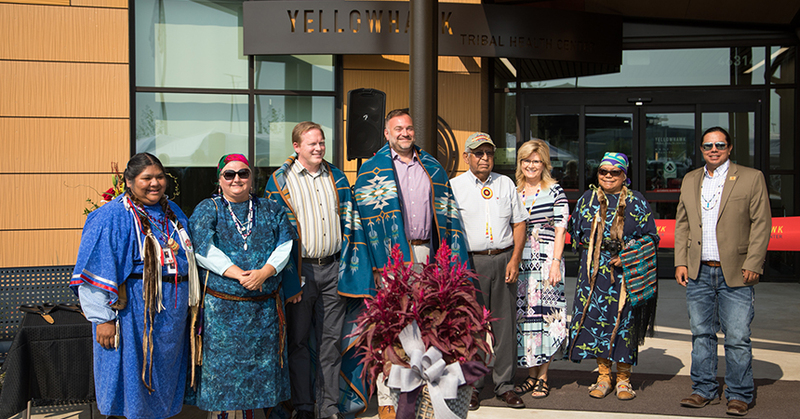 This week at its grand opening celebration, the Confederated Tribes of the Umatilla Indian Reservation (CTUIR) unveiled its Yellowhawk Tribal Health Center to a standing-room-only crowd of tribal board of trustees, representatives from tribal offices, local and state elected officials, residents and members of the business community. Energy Trust’s Executive Director Mike Colgrove was honored to be invited to speak alongside several distinguished regional leaders including William Sigo II, chairman of CTUIR general council; Gary Burke, chairman of the CTUIR board of trustees; Chairwoman Shawna Gavin of CTUIR Health Commission; Jim Wallis, CFO of Yellowhawk Tribal Health Center; and Neil Piispanen, architect and project manager. Located outside Pendleton, this beautiful steel and glass facility is more than a health and wellness hub for tribe members and other eligible American Indians and Alaska Natives living in Umatilla and Union counties. The health center also represents the lasting impact that a people and nation can have when they come together to achieve energy goals that reflect the values of the community it serves. Yellowhawk Tribal Health Center is the first tribal building in the state to enroll in Energy Trust’s Path to Net Zero offering for buildings approaching net-zero energy use. Once certified Net Zero, this building will generate as much energy as it uses over the course of a year—a path the Eastern Oregon Tribe can be proud to walk. This building is 60 percent more energy efficient than a standard building of its type, and the estimated energy savings are 646,000 kilowatt hours per year. That translates to nearly $58,000 a year in savings, which will be invested back into the community. The building is accomplishing these savings through a variety of features, including solar panels, LED lighting, high-performance insulation and windows, and an efficient heating and cooling system that recovers heat and energy from the air. Energy Trust is honored to work with the Confederated Tribes of the Umatilla Indian Reservation on Yellowhawk and several other projects underway in the community. Working with Energy Trust, the Confederated Tribes of the Umatilla Indian Reservation and associated tribal entities have saved more than 2.7 million kWhs of electricity and over 20,000 therms of natural gas. These projects, and the projects completed by more than 7,000 other homes, businesses and facilities in Umatilla County, help stimulate local economic development with cleaner, cheaper energy choices.